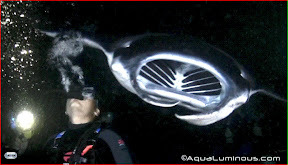 Ben Ho's Photoblog: Manta Ray Dive! So R- and I learned to dive for our Hawaii trip. Many more photos to come, but here are screenshots from the DVD from our night dive with the manta rays off the Kona coast of the Big Island of Hawaii.